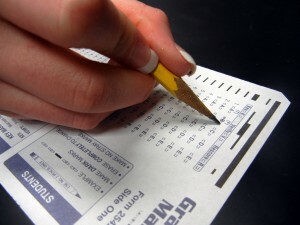 If you’ve decided to take your SAT or another test, you must already be on your way to preparing for your exam. You have plenty of material to cover before the big day. Studying is not enough, you need to plan a strategy to take your test more efficiently. Here are a few tips you should try to make the most of your time during your test. Have a healthy breakfast: Eating some superfoods before heading to the exam can help give your brain power a boost and help you concentrate. Read the instruction: The first thing you need to do is carefully read the instructions. Don’t try to skip ahead to save time. Start with what you know: Start by answering the questions you know. At least you’ll know you have that part right. Take a guess: If you don’t know the answer, take a guess. Start by eliminating the options you know are not correct and work from there. Concentrate on yourself: Pay no mind to how the others are doing, since this might affect your performance. Focus on your exam and make the best of your time. If you need some extra help to prepare for your test, sign up for a tutoring program at The Tutoring Center, Sebring FL. Give them a call at (281) 346-8120 and ask how they can help you get a better score.